A popular trend we are seeing in both rural and urban neighborhoods is the use of metal roofing on homes. Many people find that a metal roof is more visually appealing than traditional asphalt shingles, while others consider the benefits of this easy-to-install, maintenance free material to outweigh shingles. Metal roofs can be installed on new construction homes over open purlins systems or solid sub-straights. On recovers, owners can elect to install metal roof over the existing shingles if they choose to not remove and replace the shingles. In that application, metal can be installed directly over the shingles to save money (not recommended) or we can use a couple of different methods to strip out the roof and space the new roofing over the existing. Metal roofing is a proven way to protect your home. They are long lasing and require little to no maintenance. They can help lower your energy bills, and come in a wide variety of styles and colors to suit your home or business. 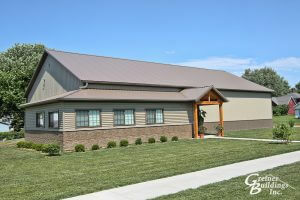 We are a licensed roofing company serving Iowa and Illinois. With our experience and the line of great products we use, you won’t find a better metal roofing solution for your home or business. Contact us today for more information on how we can help make your building last with our metal roofing.